She now is the proud owner of the newly-opened Time In Play Cafe on Holly Street in Bellingham, with a brightly day-lit cafe in the front, a huge play structure and activity zone for families in the back, side rooms that host classes and a soon-to-be local artisan gallery / consignment shop. The idea has been years in the making. Hedy has lived 2 blocks away for 12 years, fantasizing about what could be done with the building and actively visioning on the play cafe concept for two and a half years, “But I had an 18-month old at the time so I just said HALT!” She wrote the business plan in June and opened on Oct 1st of this year. Hedy bought all of the furniture and almost all of the fixtures used through craigslist, thrift stores and what she calls, “…my favorite store, The RE Store.” The cabinets, lockers, armoire, former kitchen cabinet, book shelf, and signs made from cabinet doors are all from the non-profit’s Bellingham store. 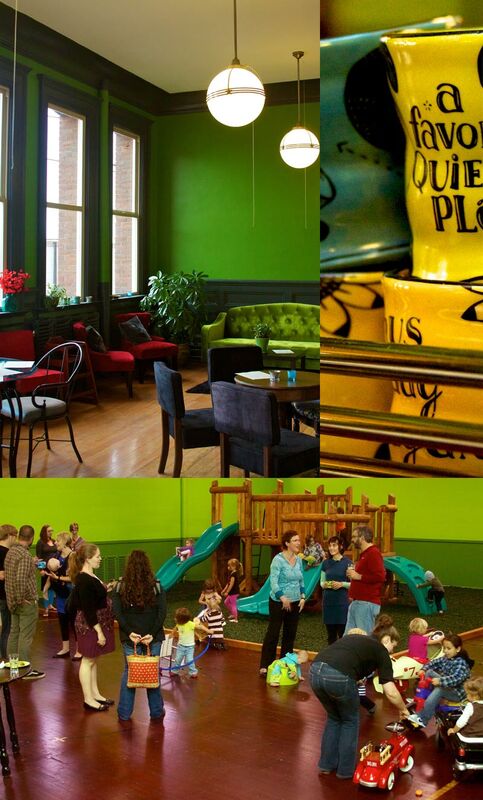 She reupholstered and refinished the chairs herself in the front cafe area as well as in the play area and side rooms. So head down, say hello to Colleen (the name for the stylish espresso machine) and check out the wild espresso bar built from reclaimed lumber by Lucas Walker. 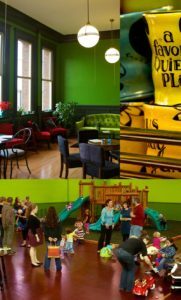 Bring your friends, your kids, or just your laptop and enjoy this gem of a cafe in Bellingham, filled with creative reuse.